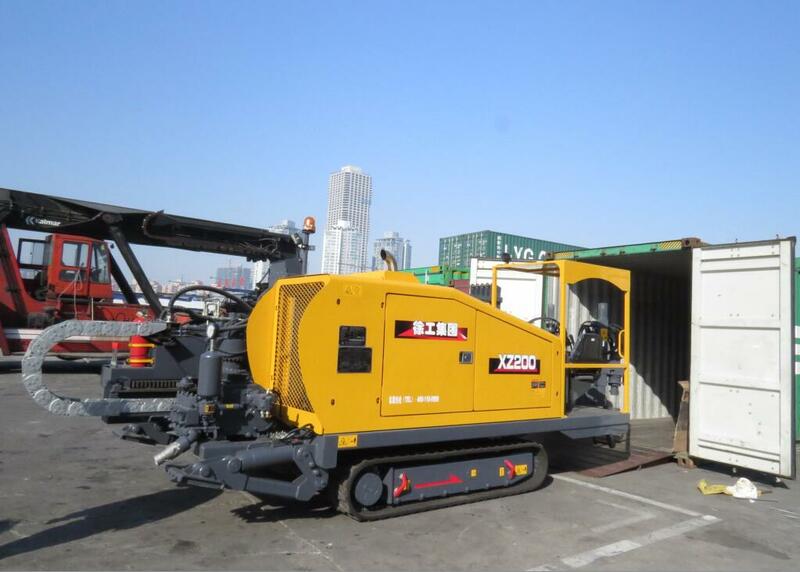 XZ200 XCMG HDD Horizontal Directional Driller has the compact structure and excellent performance. The function is all ready. Adopting hydraulic pilot control and gear and rack push-pull. The main performance parameters and control technology reached the international advanced level. Hydraulic system, power system, walking system and other main parts are picked from the first-class brand products at home and abroad with the good performance and reliability. 1. hydraulic pilot control has the comfort and flexible adjustment ability. The first-class brand hydraulic components can guarantee the machine hydraulic system reliable. 2. The gear and rack push and pull, which ensure the stability and the reliability of the transmission of power head operation. XCMG proprietary patented power head floating technology can greatly protect the drill pipe thread and increase 30% of the service life of the drill pipe. 3. High-speed push-pull system, variable motor power head can adjust the high and low speed. The drill increase adaptability and promote the efficiency of drilling rig construction. 4. It has the stable chassis support. Using the classic H beam structure. The high quality rubber tracks and the frog leg structure can provide the strong guarantee for the whole construction stability. 5. 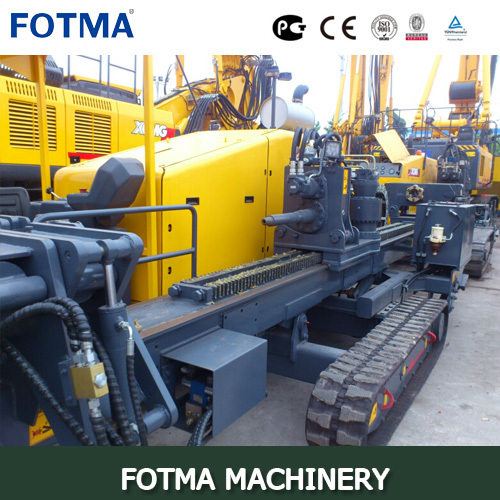 Option: the machine can be equipped with automatic loading and unloading drill pipe. Drill pipe box can accommodate 48 drill pipe, which can guarantee the construction of about 150 meters. There is automate and efficient construction. It can effectively reduce the construction cost and labor intensity. 6. Meeting the customer various needs. 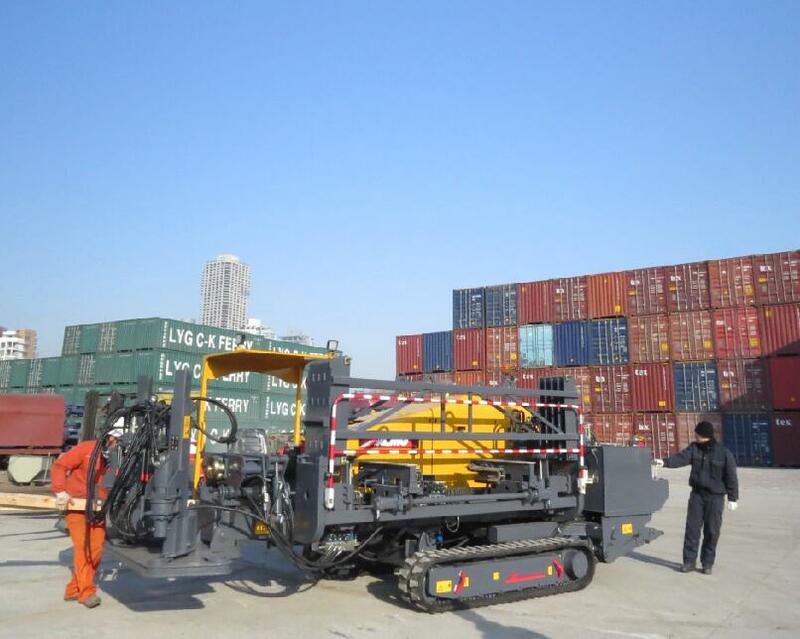 The machine can do automatic or semi-automatic loading and unloading drill rod device. 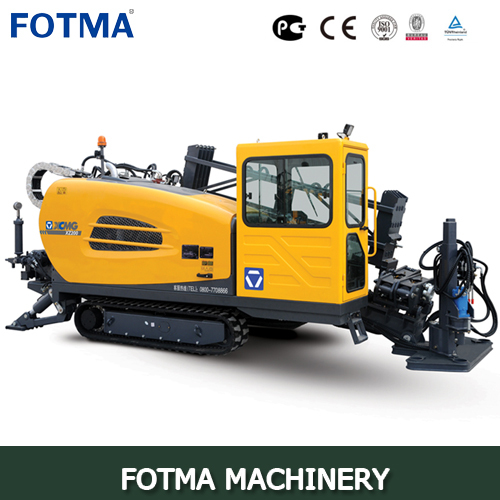 Automatic anchoring system, cabin, air conditioning, mud antifreeze, mud cleaning and mud throttling device can also be equipped with environmental protection. The high efficiency of Dongfeng cummins meeting the three electronic-controlled engine emissions. Adopting hydraulic pilot control. The hydraulic components are chosen from the domestic and international first-class brand. Five pump can complete the whole machine movement and reasonably distribute the engine power. Choosing Dongfeng Cummins turbo engine, which is powerful. Its emissions meet China's second stage standards. Option: High Dongfeng cummins turbocharged engine emissions standards, emissions can meet the three stages in China and EU Stage IIIA. XZ200 XCMG HDD Horizontal Directional Driller takes the classical H beam structure, the high quality rubber tracks and venue with strong adaptability and high reliability. The frog leg structure and oil cylinder support have the great stability. Eaton walking speed reducer has the stable performance and walking speed can be up to 2.2 km/h. The power head can finish the action of the push and pull through the gear and rack. Power head floating device can effectively protect drill pipe thread. Variable motor achieve the high-speed push and pull. The set of drill pipe is φ60 x 3000. Host is equipped with 250 l/min flow slurry pump, which provide strong mud supply for construction, ensuring the security of the construction smoothly. 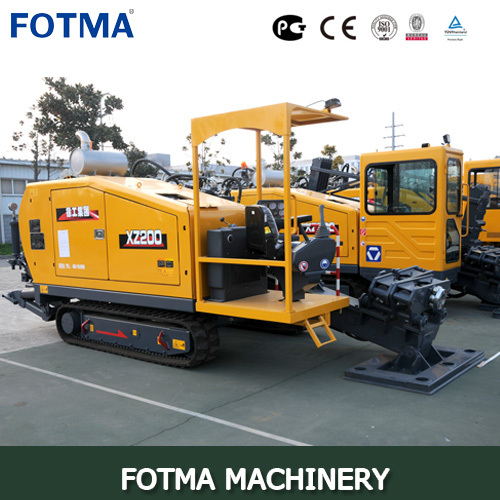 Option: winter construction with mud anti-freezing device, daily maintenance with mud cleaning device, which can improve the convenience of the construction. The host operating system can fully consider the construction process of the operator comfort and the instrument layout rationality combining hydraulic control pilot operation, control system, the operating system for the comfort and convenience, high efficiency and energy saving. Option: cabin, air conditioning. They can ensure that the host can regularly work in winter and summer. 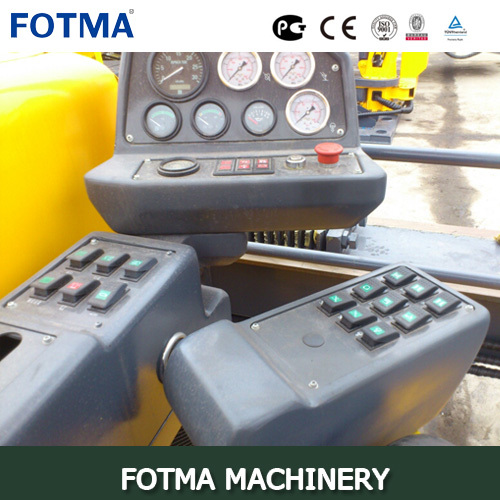 They can provide the comfortable and safe operating environment for operators and improve working efficiency. The host is equipped with the semi-automatic loading and unloading device. Through the ratating mechanism, the auxiliary drill pipe can assist loading and unloading drill rod. 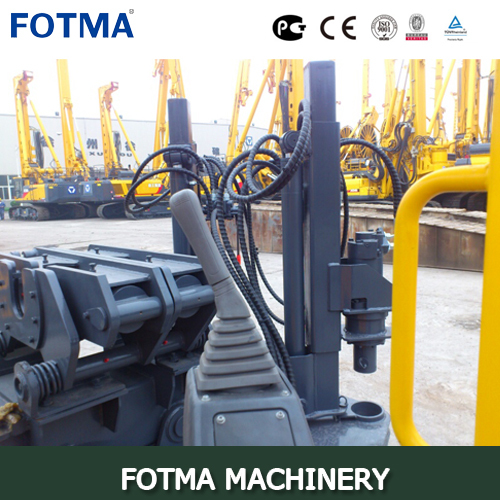 It can also be equipped with automatic drill pipe unloading system. Through the mechanical device, it can realize the automatic loading and unloading drill pipe. Drill pipe box can accommodate 48 root φ60 drill pipe. Drill pipe has the high efficiency and good reliability, which can effectively reduce the labor intensity. Host is equipped with the simple anchor device. Option: single/double anchor device automatically, auxiliary anchor drilling and pressure, high degree of automation and high pressure, which can reduce the labor intensity.